Soba is a Japanese noodle with unique health properties. 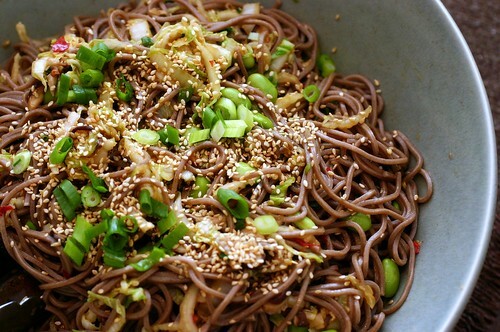 The main ingredient in soba is buckwheat. The name 'buckwheat' brings grains to mind, but it's actually a fruit seed from the same family as rhubarb - soba noodles are gluten-free. This noodle offers high-energy fuel, among other benefits. Look for it in the foreign foods aisle at your supermarket, or check a grocer that specializes in Asian ingredients. Spaghetti Squash are packed with essential fatty acids and antioxidents, including some linked to healthy vision and eyes. They're also fun to cook! Cut the squash in half lengthwise, remove the seeds, and bake or steam it until tender. Remove it from the heat (protect your hands!) and use a fork to seperate the fibers into 'noodles'. These strands have a mildly sweet taste and are strong enough to substitute for noodles in any recipe. They're also delicious on their own with olive oil, salt, and herbs. It may have 'sweet' in its name, but the Sweet Potato is one of the most nutritious vegetables out there. In fact, it's considered a low-glycemic index food because it helps stabilize blood sugar levels. Sweet Potatoes are in season in November and December, so right now their concentration of nutrients and flavour is at its peak! But how do you enjoy one as a noodle subsitute? A vegetable peeler or Spiralizer will achieve the desired shape, and then your 'noodles' can be steamed, sauteed, or enjoyed raw. Zucchini noodles are a refreshing additional to any noodle-based meal. A zucchini's many nutrients are soothing to the intestinal tract and easy to digest. It's a prime candidate for the Spiralizer, or it can be cut into long, flat pieces to substitute for the noodle layers in your favourite lasagna recipe. The zucchini is neutral enough to carry a variety of flavours (like rich pesto or garlicky tomato sauce).